Spun this joint today on the radio show. You may be familiar with Doug Sahm and his band’s cover, but this, the original, is seriously where it’s at. 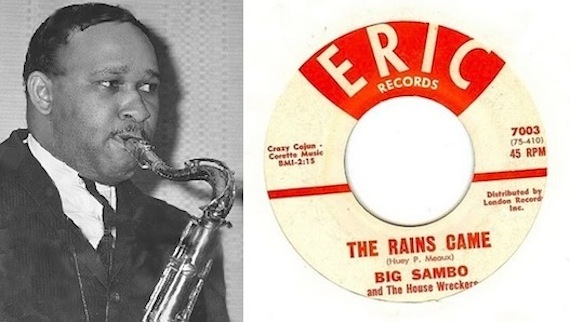 Fronted by vocalist/saxman James Young, Big Sambo & The House Wreckers hailed from the gulf coast of Texas, laying down “The Rains Came” for Eric Records in 1961. I’m sure if you’re diligent you could track the 45 down somewhere, but I was personally hipped to the track several years back via the Twilight Zone, who posted Soul Deep Vol. 1, which, itself, is highly recommended. Further reading: Found and interesting backstory regarding the tune’s history (involving the NAACP) at this blog.